As we have seen in a prior post, William C. Brown, the Senior Vice President of the New York Central Railway (and my maternal great-great-uncle), was a major public spokesman for the interests of the railroads in 1907. Brown also interacted privately with President Theodore Roosevelt over these issues in February 1907 and again in April-May 1907.This post will look at these interactions. Brown’s interaction with the President started with the former’s private letter of January 28th to Theodore P. Shonts, the Roosevelt-appointed Chairman of the Isthmian [Panama] Canal Affairs Commission, who recently had announced his resignation from that position effective March 4th. This seven-page letter’s going into great detail about the current position of the railroads is very unusual. Presumably Shonts knew all of the railroad problems and issues and by virtue of his government position had opportunities for presidential meetings. It is as if the letter really was written to be read by someone else, namely President Roosevelt. This interpretation, in my opinion, is confirmed by Brown’s immediately making the letter public. Brown’s letter emphasized the challenges facing the railroads. He said the recent “tremendous increase in the commerce of the country has almost swamped the railroads. Terminal facilities . . . are . . . inadequate; single track lines must be double-tracked; double-track roads must have three or four tracks; grades must be reduced, and the equipment of the roads must be greatly increased.” To remedy these inadequacies will be very expensive. For the New York Central, he said, in 1907 alone this will require capital investment of $130 to $ 140 million. According to Brown, railroads also were facing increased labor costs for 1907 of 8% to 14% or an increase of $75 million for all railroads. Other costs also had increased, and total costs, including labor, were up 40% from 1897. On the other hand, said Brown, “there is a continuous, organized and persistent effort on the part of shippers to reduce the [railroads’] revenues” which may lead to requests for the ICC to reduce freight rates. In addition, Congress probably will reduce compensation for the railroads’ carrying the mails. However, without increased freight rates, said Brown, railroads will be forced to substantially reduce the capital improvements that are so necessary. Shonts’ February 1st letter to Brown. Seeing Brown’s January 28th letter as really intended for other eyes, in my opinion, is also confirmed by Shonts immediately responding to Brown with a report that Shonts had discussed Brown’s letter with the President and had provided him with a copy of the letter. Brown’s February 3rd letter to Roosevelt’s Secretary. Responding to this indirect word from the President, Brown on February 3rd sent a letter to Roosevelt’s secretary, William Loeb, Jr., with enclosed copies of Brown’s previously mentioned January 28th letter to Shonts, a February 1st Wall Street Journal editorial about railroads and Brown’s correspondence with the Journal about same. Another enclosure with the letter to Loeb was Brown’s January 22, 1907, letter to Joseph Nimmo, Jr., a statistician for the Interstate Commerce Commission, responding to a request for Brown’s opinions on various issues regarding railroad regulation. Brown said “no [enacted] legislation . . . will result in injury to the railroads . . . unless the [ICC] shall deplete their revenue by reducing freight rates.” Brown said, the “spirit of hostility against the railroads which seems to be felt by member of both parties, and by the [Roosevelt] administration, whether real or not, is rapidly creating a feeling of distrust, and is discrediting the railroads . . . to such an extent as to make it very difficult at the present time to secure any money for needed improvements and promises to make it almost impossible to do so in the near future.” Brown added that he agreed with Hill’s estimate of $5 billion as the amount of needed capital investment by all the railroads over the next five years. The New York Times article about Brown’s speech came to the attention of Roosevelt. The next day (April 19th) Roosevelt wrote a letter to Brown saying he “heartedly” agreed with the part he had seen and inviting him to the White House the next week. The President especially wanted to hear Brown’s views on the issue of the valuation of railroads. That White House meeting took place on April 29th, and the nature of their discussion that day is revealed by their subsequent correspondence. Brown’s April 30th letter also said that any announcement of the President’s idea of valuation of railroad properties should “be accompanied by some statement that will reassure timid investors.” Otherwise, such an announcement could leave the calamitous impression that such valuations will be used “to decrease [freight] rates, increase taxation, or both.” Enclosed with the letter was a document with Brown’s thoughts on the valuation issue, but this document was not available from the archives. Brown closed the letter with assurances of his “very high personal regard” for the President. The President’s May 1st responsive letter said he had deleted the sentence of the speech, to which Brown had objected (railroad owners had mistakenly or selfishly failed to furnish additional facilities??). Roosevelt thought Brown’s ideas on valuation were better than the President’s draft on the subject and that the Director of the Census Bureau had cautioned the President on using its statistics on valuation of railroad securities. On May 2nd Brown replied to the President. Brown sent a page from a draft of his forthcoming (May 13th) speech in Syracuse, New York that had certain statistics. (This enclosure was not available from the archives.) 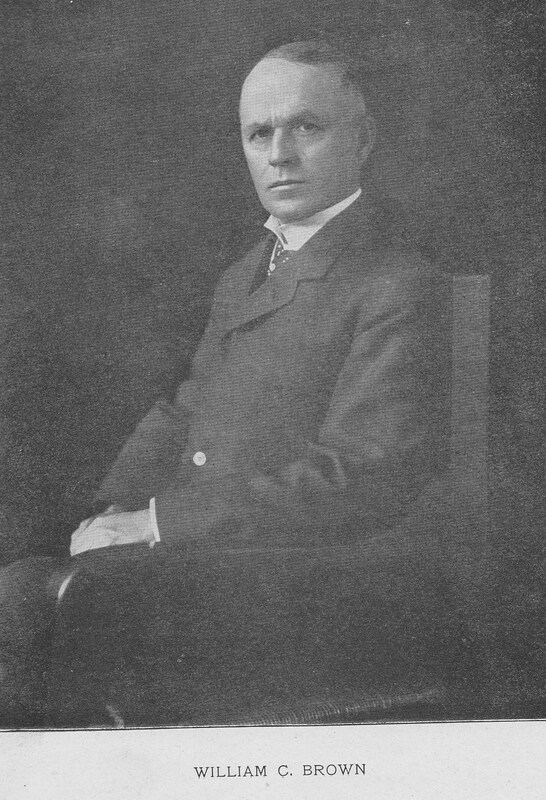 After consulting with others at the New York Central Railroad, Brown said they all thought that his statistics along with those from the Interstate Commerce Commission “will do much to restore confidence and reassure investors in regard to the safety and stability of railway securities.” Finally, Brown urged the President to call if he can be of service in any way. Again he closed with assurances of his “very high personal regard” for the President. On May 4th, the President responded to these two letters from Brown. He thanked him for the statistics he had provided, but urged Brown to make “full use of them in [his] Syracuse speech” and that if Roosevelt used them in his Decoration Day speech, it would be in a different form. The final letter in this exchange came from the President on May 9th. He said he liked the Dodge letter and already had referred to Dodge as “a railroad man who was a type of what a good citizen should be.” Roosevelt also said the final version of his Decoration Day speech will include some of Brown’s suggestions. These interactions show an amazing collaboration between a president and a private citizen. As a result of this collaboration and of Roosevelt’s discussions with other railroad executives in this time period, the President’s Decoration Day speech, which will covered in a subsequent post, contained many points that helped to alleviate the railroads angst. Letter, Brown to “My dear T.P. [Shonts] (Jan. 28, 1907) (Image # 71-0572 through 0578 provided courtesy of the Library of Congress Prints and Photographs Divisions and Theodore Roosevelt Center at Dickinson State University, www.theodorerooseveltcenter.org). As noted in a prior post, in 1900 Brown and Shonts and another Midwestern railroad executive (Paul Morton) joined Roosevelt, then Republican vice presidential candidate, on his campaign train from Quincy, Illinois to Chicago. Letter, Shonts to “My dear W. C.” Brown (Feb. 1, 1907) (Image # 71-0642 & 0643 provided courtesy of the Library of Congress Prints and Photographs Divisions and Theodore Roosevelt Center at Dickinson State University, http://www.theodorerooseveltcenter.org). The Theodore Roosevelt Center at Dickinson State University has advised me that through an unpublished analysis of several sources, including the presidential desk diaries, that on January 29, 1907, the President had a “Canal conference with Theodore Shonts.” This probably was the occasion when Shonts discussed Brown’s letter with the President. Letter, Brown to “My dear Mr. Loeb” (Feb. 3, 1907)(Image # 71-066 & 067 provided courtesy of the Library of Congress Prints and Photographs Divisions and Theodore Roosevelt Center at Dickinson State University, http://www.theodorerooseveltcenter.org). Letter, Sereno S. Pratt to W. C. Brown (Feb. 2, 1907)(Image # 71-0657 & 0658 provided courtesy of the Library of Congress Prints and Photographs Divisions and Theodore Roosevelt Center at Dickinson State University, http://www.theodorerooseveltcenter.org). Letter, Brown to Dow Jones & Co. (Feb. 1, 1907)(Image # 71-0626 provided courtesy of the Library of Congress Prints and Photographs Divisions and Theodore Roosevelt Center at Dickinson State University, http://www.theodorerooseveltcenter.org). Letter, William C. Brown to Joseph Nimmo (Jan. 22, 1907) (Image # 71-0489 through 0493 provided courtesy of the Library of Congress Prints and Photographs Divisions and Theodore Roosevelt Center at Dickinson State University, http://www.theodorerooseveltcenter.org). I wonder if this letter’s being in the Theodore Roosevelt collection at the Miller Center indicates that the letter somehow was obtained by the White House and reviewed by the President or one of his aides. William C. Brown, Address to the Buffalo Chamber of Commerce (April 18, 1907); Hughes Tells of Republic’s Foes, N.Y. Times (April 19, 1907). Letter, Roosevelt to Brown (April 19, 1907) (Image # 345-0665 provided courtesy of the Library of Congress Prints and Photographs Divisions and Theodore Roosevelt Center at Dickinson State University, www.theodorerooseveltcenter.org). W.C. Brown at the White House, N.Y. Times (Apr. 30, 1907). Letter, Brown to Roosevelt (April 30, 1907)(Image #308-0873 & 0874 provided courtesy of the Library of Congress Prints and Photographs Divisions and Theodore Roosevelt Center at Dickinson State University, www.theodorerooseveltcenter.org). Letter, Roosevelt to Brown (May 1, 1907) (Image # 345-0779 provided courtesy of the Library of Congress Prints and Photographs Divisions and Theodore Roosevelt Center at Dickinson State University, http://www.theodorerooseveltcenter.org). Roosevelt apparently was referring to one or all of the following letters to the President from the Director of the Census Bureau, all of which were provided courtesy of the Library of Congress Prints and Photographs Divisions and Theodore Roosevelt Center at Dickinson State University, http://www.theodorerooseveltcenter.org): letter, North to Roosevelt (April 22, 1907)(Image # 308-0863 through 0867); letter, North to Roosevelt (April 22, 1907)(Image # 73-0348); letter, North to Roosevelt (April 30, 1907)(Image # 308-0875 & 0876). Letter, Brown to Roosevelt (May 3, 1907)(Image # 308-0878 provided courtesy of the Library of Congress Prints and Photographs Divisions and Theodore Roosevelt Center at Dickinson State University, www.theodorerooseveltcenter.org). Letter, Roosevelt to Brown (May 4, 1907)(Image # 345-0822 provided courtesy of the Library of Congress Prints and Photographs Divisions and Theodore Roosevelt Center at Dickinson State University, www.theodorerooseveltcenter.org). Dodge was a Major General for the Union Army in the Civil War (1861-1866), an Iowa Congressman (1867-1869) and an engineer for the Union Pacific Railroad who was a leading figure in the construction of the transcontinental railway. During the 1880s and 1890s, he served as president or chief engineer of dozens of railroad companies. Letter, Brown to Roosevelt (May 8, 1907) (Image # 308-0884 provided courtesy of the Library of Congress Prints and Photographs Divisions and Theodore Roosevelt Center at Dickinson State University, www.theodorerooseveltcenter.org). Letter, Roosevelt to Brown (May 9, 1907) (Image # 345-0867 provided courtesy of the Library of Congress Prints and Photographs Divisions and Theodore Roosevelt Center at Dickinson State University, www.theodorerooseveltcenter.org).